IHG Rewards Club released their Cyber week deals that are valid for bookings between 8AM ET on November 28 to 8AM ET on December 2, 2016. Members can save up to 30% off their stays, save 15% off Cash + Points redemptions (cash portion), buy IHG Rewards Club points at 100% bonus, redeem points for auction packages and more. You can access the IHG Rewards Club Cyber week sale here. Travel near, travel far. For one week only, book stays at select hotels across the U.S., Caribbean, Central and South America that are both comfortable and convenient to wherever your adventures take you. Make plans for your next getaway by choosing a destination, or for a special rate at a Holiday Inn Club Vacations® resort, click here to explore and book. The Cyber Week offer saves you 15-30% at nearly 2,000 hotels, but hurry – this deal won’t last long. Book from November 28 at 8:00 a.m. to December 2 at 8:00 p.m. The “Cyber Week Sale” promotional rate is valid only for bookings made from November 28, 2016 through December 2, 2016 and consumed December 1, 2016 through March 31, 2017 at participating hotels in the United States, Caribbean, Central America and South America. A minimum of three (3) consecutive nights is required in order to qualify for the discount, which ranges from 15%-30% off the Best Flexible Rate. Discount varies by hotel, blackout dates apply, rooms subject to availability. Booking must be made at least three (3) days in advance. A one (1) night penalty will be applied if reservation is cancelled within 48 hours of stay. Hotel policy varies in regards to the number of guests allowed per room. Not applicable with other discounted rate promotions. Not applicable to group bookings. Hotel specific early departure fee applies. Not only will you stay for less, but you’ll also retain more of your IHG® Rewards Club points—and you can keep saving for future Reward Nights at any IHG® property. So whether you’re traveling on business or crossing a destination off your bucket list, make your next trip more rewarding by combining Points & Cash. • IHG® Rewards Club members must be logged in to receive % savings. • Stay dates include 11/28/16-1/31/17 with blackout dates of 12/30/16-12/31/16. • 10% and 15% discount is offered at time of booking and only pertains to the cash cost of bookings. • To receive the 15% discount, must be an IHG Rewards Club Select or Classic Credit Cardmember at the time of booking. The best week of the year has arrived. Book your next holiday during Cyber Week and get a 30% discount on Best Flexible Rate as a benefit to IHG® Rewards Club members. Stay at a variety of beautiful properties in Mexico, including InterContinental® Hotels & Resorts, Crowne Plaza® Hotels & Resorts, Holiday Inn®, Holiday Inn Express®, Holiday Inn Resort®, Staybridge Suites® and Hotel Indigo®. Book your next stay from November 28 at 8:00 a.m. to December 2 at 9:00 p.m. Eastern Time and stay from November 29, 2016 until June 9, 2017. An extra night can make all the difference, defining the line between a trip and a vacation. Transform any venture into a relaxing, recharging experience when you save 15-25%* by booking 3 or more nights at any of our participating Canadian properties. When you stay with IHG®, it’s 3 nights a dream. *Must book a minimum of 3-6 days prior to arrival. (Depending on participating hotel). Rate is non-refundable, and must be paid in full at time of booking. For IHG® Rewards Club members, points or miles will be awarded on every qualifying stay booked at the promotional rate code ID3NC at participating InterContinental®, Crowne Plaza®, Hotel Indigo®, Holiday Inn®, Holiday Inn Express®, Staybridge Suites® and Candlewood Suites® hotels in Canada now through to March 31, 2017. Promotion end date may change without notice. A stay is defined as three (3) nights or more consecutive nights at the same hotel, regardless of frequency of check-in/out. Hotels reserve the right to black out peak period availability. You must be a miles collector with a preferred alliance in order to collect miles. For a list of participating airlines and partners, further offer details, earning structure and IHG Rewards Club Terms and Conditions, visit www.ihgrewardsclub.com. Subject to standard IHG Rewards Club program Terms and Conditions. All airline and partner program terms and conditions apply. This is basically a timeshare presentation deal. Don’t end up buying one or it is the most expensive trip of your lifetime! 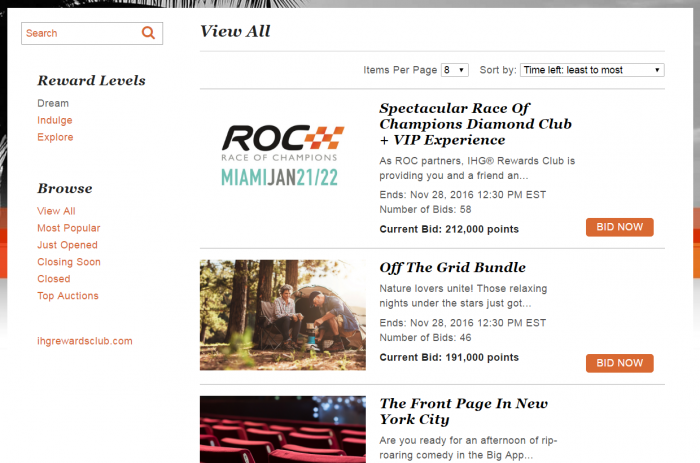 IHG Rewards Club has Cyber week points sale going on until Friday that I have covered here. You an use your IHG Rewards Club to “purchase” select items. Visit Hawaii and explore Honolulu at Holiday Inn Resorts® Waikiki Beachcomber. With the Pacific Ocean just 300 feet from the resort, basking on the charming Waikiki beach is effortless. Enjoy large, spacious rooms and explore our array of amenities like an on-site spa, beautiful swimming pool and sauna, and the Magic of Polynesia night show. IHG Rewards Club® members save up to 15% on their stay with Your Rate— even more reason to book your Hawaiian vacation today. Enjoy an incredible Hawaiian getaway and find all of the amazing things that Honolulu has to offer at Holiday Inn Resorts® Waikiki Beachcomber. Some of these are on-going offers such as the Bonus Points Packages or getting bonus points for your first Dining program purchase. Probably worth having a look at the rates offered during this ale to see if you can save over other available rates.